You'll find the highest concentration of accommodation in Curacao clustered on the southern coastline near Otrabonda and Schlaroo. There, bed and breakfasts and mid-range hotels feature swimming pools and, occasionally, attached casinos. Look east down the coast--near Marie Pampoen--to stay at an all-inclusive luxury beach resort. Other popular places to stay in Curacao include Sint Michel, Jan Thiel, and Sabana Westpunt. Take a trip to Curacao and lounge on its picture-perfect beaches and coves. Although part of the Kingdom of Netherlands, the island's population has developed its own distinct culture, a blend of Afro-Caribbean and Latin American, with a Creole language called Papiamento. Along with its neighbors, Aruba and Bonaire, Curacao sits outside the Caribbean "hurricane zone" and boasts a warm, breezy climate throughout the year. On a Curacao vacation, you can laze, dive, or snorkel on its scenic stretches of sand, visit charming plantations in the interior, or roam the streets of Willemstad, renowned for its distinct architecture. Willemstad: Located in the southern section of this tropical Caribbean island, the nation's capital boasts one of the oldest synagogues in the Americas, a historic center designated as a World Heritage Site, and colorful architecture. Sabana Westpunt: Expand your Curacao itinerary by visiting this quaint town, known for its scuba diving center, boat tours, reefs, and an explorable underwater airplane wreck. Sint Willibrordus: Close to the west coast, this town is mostly known for its grand Roman Catholic church built in the Neo-Gothic style. Barber: Located at a junction of roads in the western part of the island, Barber is home to Curacao's oldest kapok tree and serves as an excellent starting point for exciting tours off the beaten track. Queen Emma Pontoon Bridge: Examine huge oceangoing vessels leaving and entering the harbor from this permanent pontoon bridge, which connects Otrobanda and Punda city quarters. Kenepa Beach:	Partly shaded by manchineel trees and located behind a salt marsh, this is one of the island's most exotic sandy beaches. Dolphin Academy Curacao: Interact with the ocean's smartest mammals at a complex staffed with professional photographers and expert dolphin trainers. Punda: Check out this pedestrianized shopping quarter during your Curacao vacation--it contains 17th-century architecture and floating markets selling fresh local fruit and fish. Cas Abou Beach:	This family-friendly beach is surrounded by tree-covered hills, its crystalline waters ideal for snorkeling and scuba diving. Shete Boka National Park:	Go on a hiking tour through this park, boasting picturesque bays, coves, cliffs, underground caves, and turtle breeding grounds. Riffort Village: This village near the capital became popular among tourists when its World Heritage-listed fort opened up to a variety of dining and shopping options. Hato Caves: Exploring an ancient cave full of bizarre rock formations and petroglyphs left by its original inhabitants many centuries ago remains one of the most adventurous things to do in Curacao. Curacao Sea Aquarium: This family-friendly aquarium offers a variety of entertaining activities, such as observing the dolphins undertake acrobatic feats and diving underwater to hand-feed sea turtles, manta rays, and sharks. 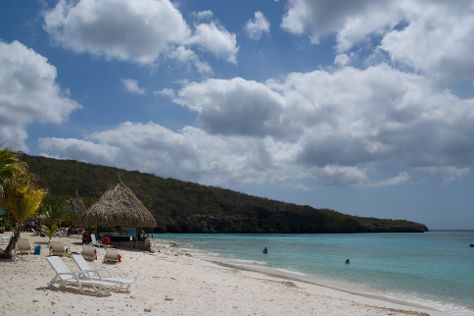 Klein (Little) Curacao: Although this small island has a dark slaveholding history, it now serves as a calm tourist destination suited for sunbathing, swimming, and diving. Curacao offers more than just sun, sea, and sand to keep your kids entertained. The island nation has many natural wonders just waiting to be explored, and recreational and educational facilities sheltering exotic animal species. The island nation's capital, Willemstad is a great starting point for a family-friendly vacation in Curacao. The city offers a wide array of cultural and natural landmarks to keep your kids interested and active. Sabana Westpunt is also an excellent destination for children. The exciting diving spots here are perfect for your kids to get their snorkeling gear on and start exploring the marine world. If you want to go hiking with your kids in a safe environment, visit Barber, which is known for its natural wonders. Besides hitting the beach and swimming at hotel pools, you can take your kids on various entertaining nature tours in Curacao. Dolphin Academy Curacao is an excellent kid-oriented attraction, where you can swim with dolphins, observe the rich marine life, and watch fun shows. The site also contains a ship museum with an underwater observation deck. If your kids just want pure fun, visit Adventure City, which is equipped with arcade games, bumper cars, play houses, and a swinging boat. Include Curacao Ostrich Farm on your Curacao itinerary if you want your kids to observe and feed ostriches and emus in an eco-friendly environment. The remote farm also shelters potbellied pigs, crocodiles, and peacocks. You shouldn't worry about planning your family's Curacao vacation during hurricane season, as the island lies outside the storm's damaging effects. However, November through February can get rainy, which can hinder your holiday plans. Some parts of the island are plagued with mosquitoes, so make sure to bring plenty of bug repellent. Carnivals throughout the Caribbean may have a Mardi Gras atmosphere, but in Curacao the adult event also contains an addition for children. This includes costumed parades and a competitions for the event king and queen--chosen from among the participating kids. If your kids get easily bored in public transport, renting a car may be the best solution. Bicycle rentals are also an excellent choice in coastal areas away from urban traffic. Curacao's local food called "krioyo" boasts a blend of techniques and flavors found in Latin American and Caribbean cuisines, but culinary influences from the Netherlands, India, Indonesia, China, and Suriname can also be felt here. Popular dishes include a stew made of papaya and beef or goat meat, soups made from seafood and okra, and fried pastries with cheese, tuna, and ham fillings. Fried plantain is the most common side dish, while bread rolls are usually made according to a Portuguese recipe. During your Curacao holiday, you can also find many hospitable spots which serve dishes and alcoholic drinks similar to those in English public houses. The island also has a lot of Chinese restaurants, but their dishes have a distinct Indonesian flair rather than Chinese. Almost every restaurant also serves Dutch specialties, such as oliebollen (a variety of dumplings) and croquettes. Many exquisite buildings in Willemstad offer an excellent shopping experience for tourists. Punda neighborhood with pedestrian-only streets remains the capital's main shopping area, where you can find a great selection of branded clothing, perfumes, electronics, china, crystals, embroidery, and accessories. Breedestraat in Otrobanda is yet another of Willemstad's popular entertainment and shopping areas, which offers a remarkable view of the sea and waterfront. Here you can find both globally famous brands and local arts and crafts. Don't forget to visit outdoor markets during your Curacao holiday, such as Floating Market, where you can look for produce, handicrafts made from recycled calabash and coconut, and freshly made meals. Although people in Curacao are known as very friendly and willing to help, the island nation still has a few bad eggs that make the news. It's preferable not to wander too far from the beaten paths alone. Put your valuables out of sight as you explore, alone or in a group. Should you rent a car on your Curacao trip, do not leave your vehicle unlocked in public places. Some hotels and resorts in gated properties will issue ID cards for visitors for additional safety purposes. Bear in mind that Curacao is expensive. Always check the currency exchange rate, especially when visiting gas stations. Going on various annual festivals is one of the most exciting things to do in Curacao. Most events incorporate parades and music. The most prominent event is the Carnival, starting New Year's day and going on through January. Sponsored by big brewing companies, festivals such as Heineken Regatta in January and Amstel Curacao race in November bring many spectators to boat and cycling races. These sporting events are usually followed by barbeques and beach parties. Another great event for tourists is the Restaurant Week, held during the low season. Hundreds of restaurants all over Curacao partake in making delicious three-course meals and selling them at great value. Most locals speak the ABC (Aruba, Bonaire, Curacao) language Papiamento, as well as Dutch, Spanish, English, and Portuguese. They greatly enjoy when you make an effort to speak their native tongue and will gladly help you pronounce words should you simply ask them. The locals also tend to be very open and love to greet their friends loudly with hugs and kisses. Once you gain their trust, you can follow suit. In the meantime, act respectfully and politely green everyone you meet with a handshake. Expect warm weather throughout the entire year in Curacao, with average temperatures ranging between 26 C and 29 C (80 F and 84 F). The island nation's climate is classified as tropical savannah climate, similar to those in equatorial Africa and southern Asia. January to September is the dry season, while the rest of the year is reserved for the shorter wet season. Although temperatures are relatively constant, trade winds can bring cooler air during the day and warmth during the night. Although Curacao lies outside the Caribbean hurricane belt, the island can be affected by smaller tropical storms. Curacao possesses a developed network of roads across the entire island, with road services available 24 hours a day, including holidays. You can easily reach all of your Curacao attractions on foot, or by bicycle, taxi, car, boat, bus, or guided tour. Public transportation includes both long-distance sightseeing buses and small vans used solely for urban routes. Major bus terminals are located near the post office in Punda quarter and next to the underpass in Otrobanda quarter. Busses depart from those terminals every hour eastward and every two hours westward--only on Sundays is the schedule less frequent. Car rental options are available in the capital, and all you need is a valid driver's license. The service charge in hotels will come to 12 percent of your bill, while the government sales tax will be 7 percent. Bellhops and porters expect a 1 USD tip per bag, while the cleaning staff should be left about 3 USD per night for keeping your room tidy. However, you should always check in advance with the hotel or resort for their tipping policies, since many all-inclusive establishments prohibit it. Restaurants in Curacao have a 5 percent sales tax, and most also include a service charge on the bill. If you are pleased with the quality of service, you can always leave an extra 5 to 10 percent in cash. Even though tipping taxi drivers is not mandatory, they are known to be quite friendly and helpful with the luggage, so you can always set some money aside and leave an extra 10 percent of the fare.